By late November our boat refitting was complete and Amoenitas was ready for sea again. 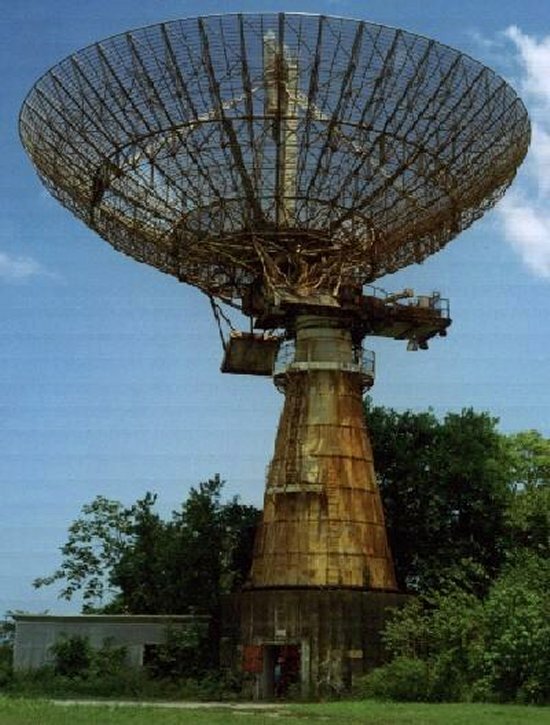 However, before our story leaves Trinidad, we'd like you to see this picture of a huge space tracking radar that NASA operated on a hilltop site overlooking the north coast. We cycled up there one very hot and humid day and were amazed to find we had free access to the structure. Dave was delighted to be able to climb up into the dish and beyond to the top of the tower supporting the feed horn of what, judging by the waveguide dimensions, was an 800MHz system. It was a great experience to be able to examine the massively engineered mechanics and 1950/60s radar technology, not to mention the stupendous view eastwards along the northern coastline of the island. Finally, on the 4th Dec, a slot appeared in the strong trade winds and high seas enabling us to make the 85Nm passage north to Grenada. Known as the spice island, we found it's less humid climate a welcome change after our eleven weeks in Trinidad. Again we were frustrated by strong weather conditions delaying our progress north but we had many old sailing friends there to pass the time with, as well as touring much of the island by car. Here's a picture of Di on Fort George,overlooking the quaint and historic capital, St Georges. In order to fulfil our plans this year, we needed to get up the island chain quickly. So our next hop was of 190nm, by passing the Grenadines, St Vincent and St Lucia to the French island of Martinique. We spent a very memorable Christmas there, anchored off the small town of St Anne on the SW coast. This picture shows a bathing stop at the popular Grand Saline beach on our Christmas Eve hike along the superb south coast trail. Christmas lunch was again a beach event, shared with around 50 sailing friends from all around the world. We took over a restaurant's covered area by the sea for a Pot Luck (US term for bring and share). Boxing Day saw us under sail again but lack of good winds this time confined us to the west coast of Martinique Nevertheless, we made good use of the time stocking up and enjoying the typically French cuisine. 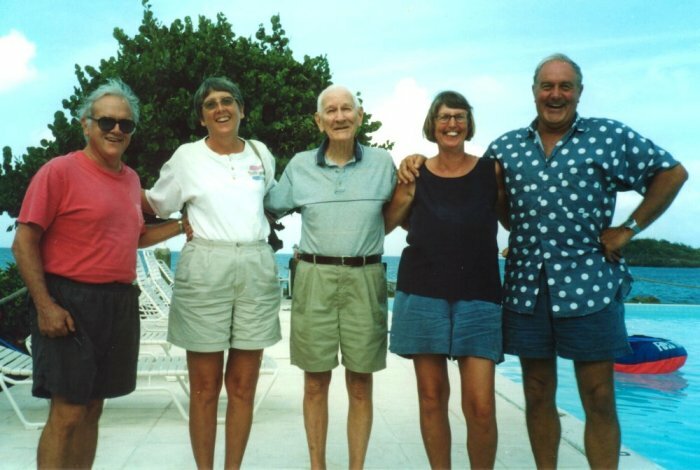 We really needed to get to the US Virgin Isles for New Year as we had planned to share it with some US and UK HAM radio friends. 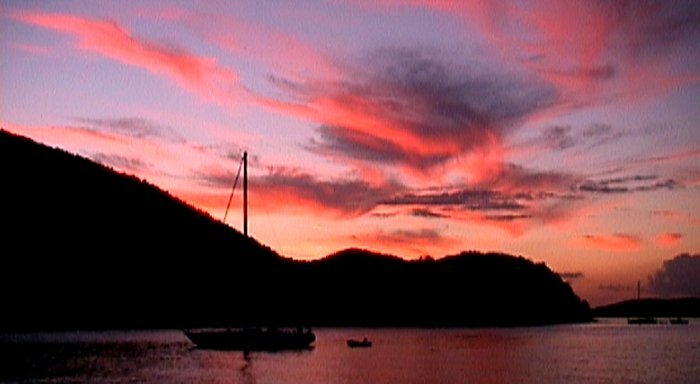 Light winds or not, we made the 320nm leg up to St Croix by the 30th to see in 2001 with sailing friends aboard Amoenitas, watching a stupendous firework display. New Years day was another HAMfest. Dave logs into the Caribbean Amateur Radio Maritime Mobile Net most mornings around 07.00 to give position reports on passage, get vital weather data and share other information useful to we cruisers. It has also been a great way to make lots of new friends, mainly American as Dave and friend Clive from Revid are the only non US HAMs amongst the around 150 regular contributors. Some of the linchpins of this net live on St Croix so we couldn't pass by without saying hello. Centre of the group is Lou, our daily net controller and ever friendly voice over the ether as we combat the elements. On the left is John, Lou's Sunday relief controller with his wife Jeanette. The other two need no introduction. It was great to meet up with the faces behind the voices. 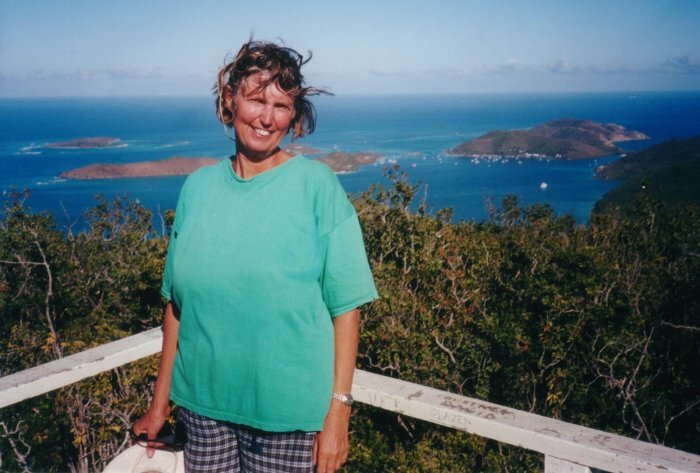 Twenty miles or so north of St Croix are the around forty, tightly packed islands of the US and British Virgins. These are a sailing and cruise ship Mecca which we live-aboardss view as somewhat of a mixed blessing. The cruise ships mean ports packed with tourists and hundreds of jewelry, perfume and gift shops with nowhere catering for the everyday needs of a cruising sailor. We are also outnumbered around 20:1 by charter boats, mainly with US crews. This makes for every anchorage being littered with mooring buoys at $20 a night and astronomical prices ashore. Still the antics of the charter fleet provide endless free entertainment. The good news is the superb walking with magnificent seascapes. 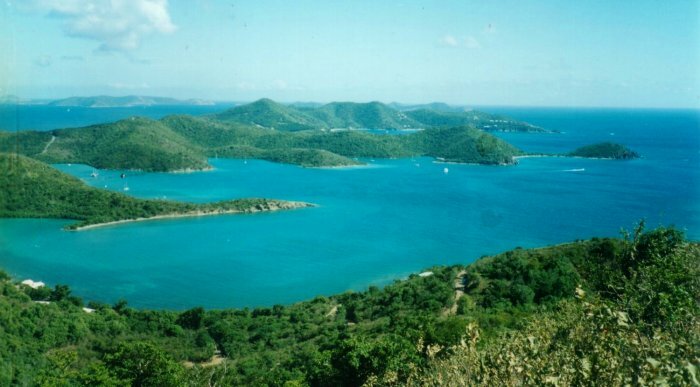 This view is from St John, most of which is an unspoiled National Park with well kept and signposted trails. The little Cay in the foreground was a favourite snorkeling spot with many vividly coloured corals, sponges and fish. This next vista is the view eastwards from a high point we reached when crossing over the island and back on the Johnny Horne trail to Coral Bay. It was a very steep and rough walk on a very warm Sunday but views like this are ample reward for any degree of discomfort. In Coral Bay we spotted the vehicle below all dressed up with nowhere to go. The Virgins are relatively arid islands compared with the Windwards or Trinidad to the south. There this truck would have rusted to powder and been lost in an even greater forest of vegetation. The north of the BVI island of Virgin Gorda has a large sound which afforded us good shelter when large swells came down from a major Atlantic gale system. We visited several bays, some with romantic names like Drake's Anchorage and again we found good walking in the Gorda Peak Park. The high point there is at 1500ft, this view being toward the NE from the observation tower, kindly provided to get above the vegitation. 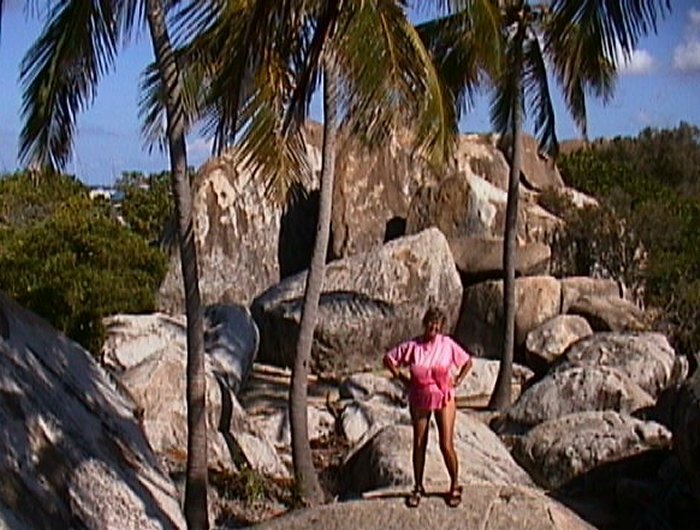 Several sq km of the southern end of Virgin Gorda are strewn with large granite boulders up to 15m high. They were formed around 150M years ago when lava was crystalised under high pressure, the softer surrounding rock subsequently eroding away. The remaining rock field makes a scenic site for holiday homes and good exploring on the shoreline where one can climb, crawl and swim in the passages between and under them. Here's a picture of Di beside some. We got to visit three of the major USVIs (St Croix, St Thomas & St John, a similar number of BVIs (Jost Van Dyke, Tortola & Virgin Gorda) plus a number of Cays and lesser islands. It was nice to have everything so close but it is not really the sort of cruising ground we like best. Our tastes are more for the quiet, unspoilt places of the planet. We did manage to find some respite from the hordes by anchoring in a Newfound Bay on the NE of St John which was protected by a fobidding, horseshoe coral reef with a very narrow entrance. No charterers allowed there, just the sea birds and four resident turtles who observed us nosily whilst keeping at a safe distance. As usual we leave you with one of our tropical sunsets. This from the lovely protected Leinster Bay in the National Park on the north of St John. 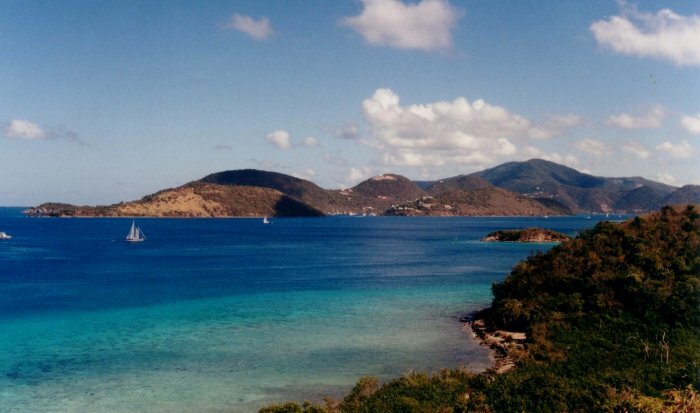 Our next call will be at the Spanish Virgin island of Culebra, really part of Puerto Rico, a US dependency. Then along the south coast of Puerto Rico to the Dominican Republic. We are unsure yet whether to go along the south or north side of Hispaniola but whichever, there are no plans to risk a stop in Haiti! Then on to Cuba with Jamaica featuring somewhere in the plan. Still we haven't decided where to hole up next summer, for the hurricane season. It could be on the US Eastern Seaboard or back to Trinidad which would give us a better start heading down to Panama for a Canal transit into the Pacific early in 2002.